The Emory community is invited to Glenn Memorial United Methodist Church on the campus for Emory-Glenn Sunday on Sept. 27. 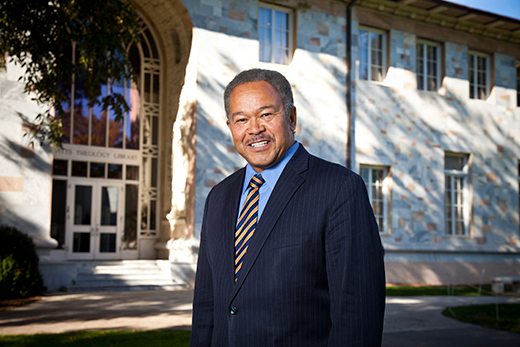 Glenn Memorial and Emory have hosted the event for many years, usually during Homecoming Weekend, notes Gary Hauk, university vice president and deputy to the president. Robert Franklin, Jr., the James T. and Berta R. Laney Professor in Moral Leadership in the Candler School of Theology, will be the guest preacher at the 11 a.m. worship service in the sanctuary. "My topic, 'The Grand Ethic,' invokes the courageous and civilizing role of grandparents and community elders in our history," Franklin says. "My grandmother, like many others, was an exceptional moral role model whose love, service, sacrifice and vision of the common good offers clues for how we all should live. "Grandmothers are community anchors," he adds. "Similarly, universities and historic congregations anchor us in memory and moral obligation. It is an honor to address this great congregation on the responsibilities and assets of Glenn and Emory." Emory President James Wagner; Bridgette Young Ross, dean of the Chapel and Spiritual Life; and Emory students will also participate in the service. Both the Glenn Chancel Choir and Emory's Voices of Inner Strength Gospel Choir will sing. Prior to the service, Franklin will speak on "Moral Leadership and the Modern University" at 9:45 a.m. in the Jake Ward Fellowship Hall located in the Church School Building behind the sanctuary. All current and retired Emory faculty are invited to wear academic regalia and join in the opening processional for the worship service, says P. Alice Rogers, senior pastor at Glenn Memorial. "The rich partnership between Glenn and Emory will be witnessed in the opening processional as Emory faculty who are members at Glenn as well as those from around the university participate in that procession," Rogers says. "Many of our members are on the faculty and staff of the university, so Homecoming Weekend provides an excellent opportunity to celebrate the history and partnership," she adds. "There will be a time during the welcome to recognize the Emory-Glenn relationship as greetings will be brought by President Wagner and Dean Ross." Ross describes the service as "a Christian service that blends the Glenn and University Worship formats." "There will be students, mostly from University Worship and Emory Wesley Fellowship, fully participating and leading the service in ushering, doing readings and leading prayers," she says. Ross was the preacher for the service last year. "I was honored to be invited by the committee, which consists of Glenn members and University staff," she says. "I think each year, we evolve into having more students fully engaged in the service, instead of feeling that Glenn is 'hosting' Emory visitors." Ross also points out the collaborative projects the Emory-Glenn committee works throughout the year to plan, including Dinner with 12 Strangers and a special offering during this service for a student emergency fund. "Our vision is for the university and the church to reflect both shared Methodist roots and a commitment to serving the community," she says. The Glenn congregation had its genesis in 1920 in a gathering of faculty members, students and community members who met for worship in the chapel of what is now referred to as the Old Theology Building, formerly known as Pitts Library, Hauk says.